Gary Allason drove more than 100 kilometres from Purdy, Washington to attend the Washington State Republican Party event. It began as a night with a few dozen Trump supporters awkwardly hovering around bowls of trail mix while Fox News blared in the background. But as Donald Trump clinched Ohio, the half-empty room filled up and the canapés were served. Tuesday night, just before midnight, as most news outlets declared Trump the winner, a loud cheer erupted from the crowd, which by this point, was a sea of red hats. "Trump, Trump," the crowd chanted. Gary Allason, 55, drove more than 100 kilometres from Purdy, Washington to attend the Washington State Republican Party event. Allason said he voted for Trump because the United States needs to be defended from Hillary Clinton. "Hillary is corrupt… what you see with the FBI and the Justice Department and the e-mails — total corruption. "Drain the Swamp is the exact right phrase for what needs to happen." 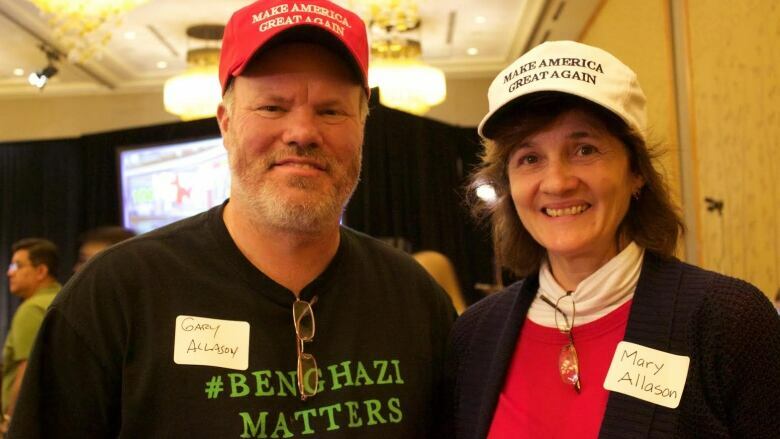 Allason also blames Clinton for the fatalities in the 2012 attacks on the U.S compound in Benghazi, Libya. "[Clinton] abandoned those men in Benghazi. She took her political security and put it ahead of national security and those Americans died. The blood is on her hands." Allason dismissed claims that Trump is a racist, a bigot or a sexist. "I think a lot of the criticism is 'trumped' up. They cover story after story after story on Trump and these huge issues with Hillary don't even get brought up. "So no, I have absolutely no problems with his character. I believe he loves America." Wen Liu, an interpreter and writer who moved to the United states from China 25 years ago, described herself as a "proud Chinese American. Laughing, she also called herself a "deplorable," a term Clinton used during the campaign to describe Trump supporters. Interpreter Wen Liu moved to the U.S. from China 25 year ago. 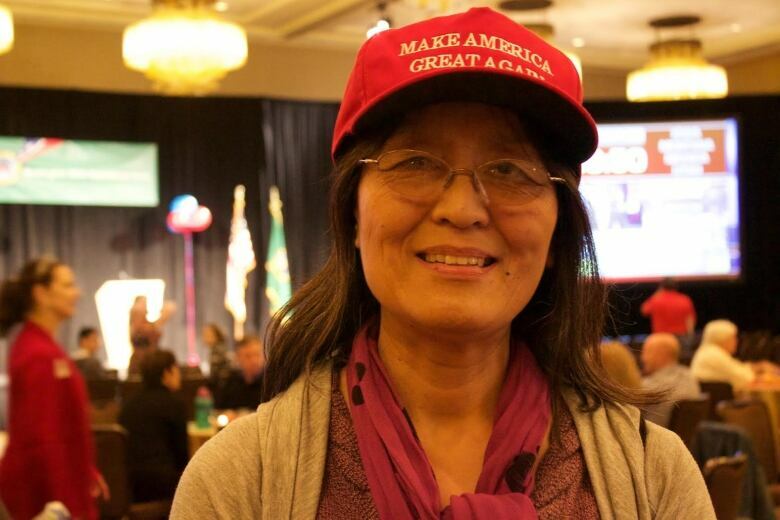 “I’m a proud Chinese American and a ‘deplorable,” she laughed, referring to Hillary Clinton's comment that half of Donald Trump supporters are "deplorables." Liu said she supports Trump's opposition to the Iraq war. (Trump's support for that war was the subject of debate during the campaign. Opponents argued that he in fact supported the war). "The Iraq war brought on ISIS — I agree with Donald Trump on that. There are a lot of things I like about Trump." Liu said she also dislikes political correctness and agrees with Trump that the U.S. has been declining in terms of leadership in the world. "Russia is getting very strong, China is getting very strong, even in comparison the U.S. has not been very strong in the past eight years." Liu equates Clinton with socialism — an ideology she does not support. "Democrats are closer to socialists and that's not where I want the United States to go." 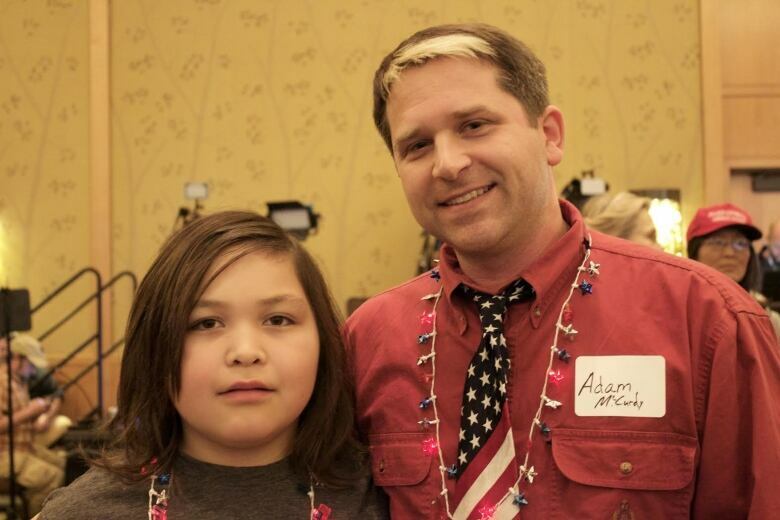 "I want a strong country, a strong defence and I like people with strong moral values" said Adam McCurdy, 38, who came to the event with his son Isiah McCurdy, 11. Adam McCurdy, right, pictured with his son, Isiah, 11, said Trump "speaks the truth." McCurdy works for the Marysville School District and calls himself a Libertarian-Republican. He admitted Trump can be a bit crass but that's also part of the reason he voted for him, too. "I don't excuse some of the rude things he's said. I don't speak that way… I would ask that he would tone that down. "But I like that he talks what he thinks. He knows sometimes he might be a bit arrogant but to to him he's being sincere and I can respect sincerity. "He speaks the truth," said McCurdy.